Clear, toughened Single Glazed Framed Glass Doors are available to sit within aluminium frames to give improved acoustic performance for 10/12mm non-fire rated or 10mm Pyran S fire rated applications. 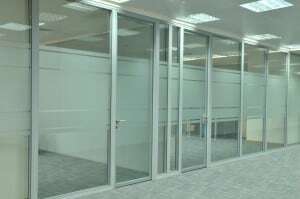 Hinged glass partition doors are both versatile and durable for a wide range of environments. Frameless Glass Doors are fitted on a two way pivot system which allows the door to operate on a self-closing mechanism. These luxury single glazed doors can be integrated with glass partition to offer a frameless designer appearance. Frameless glass pivot doors are compatible in any commercial environment. For that architectural stainless and glass aesthetic, Sliding Glass Doors have minimal framework combined with ease of operation and the highest level of glass sliding door acoustic performance. 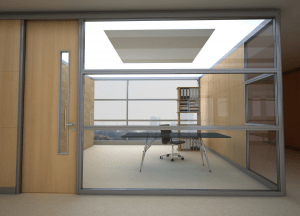 Double Glazed Doors are able to achieve up to 36Rw(dB) sound resistance creating a feeling of privacy whilst maintaining an unrestricted visual of an open office. The doors are available with a choice of ironmongery and can be supplied with internal blinds. Our Timber Doors comply with DDA regulations and there is a choice of veneers, vision panels, access controls, ironmongery and bespoke options designed to meet the required specification.